In all my years as a professional meteorologist and spending my younger years living in tornado alley, I have never witnessed anything near the unpredictable, awesome power of the tornado that crawled across Hennessey, OK on Saturday. A tornado rips through Hennessey, Oklahoma, on Saturday destroying a hog farm in Kingfisher County. I was watching north central Oklahoma for the threat of tornadoes and a warning was issued for Kingfisher and Garfield counties. Next thing I know, my newsroom executive producer is running over telling me to get hooked up, we have live chopper shots of a possible tornado; they want me on the air. We broke into programming just before 3:30p.m. EDT. Along with our CNN audience, I witnessed a large rotating wall cloud with a slight lowering. 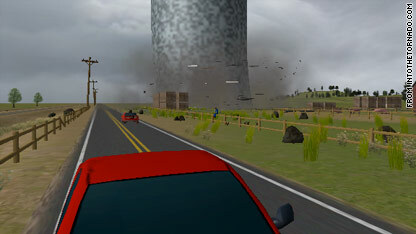 It turned into a funnel that gradually lowered to the ground and became a large, violent tornado. It was a classic looking “stovepipe” tornado, meaning it was very straight, up and down. The clarity of the funnel was amazing. It was in the middle of a field. Moments later, it leveled a hog farm. The roof was peeled away and debris was flying everywhere. It was an eerie feeling seeing this happen live, not knowing the status of the people that could have been in the building. We rewind the tape, and show the tornado bearing down on the barn. Next thing we know, another tornado has formed and is on the ground. Back to live aerials. This happened 11 more times, and miraculously the tornadoes never hit any other structures. Due to the slow movement of the parent storm, Lake Carl Blackwell was evacuated, and I-35 was shut down to allow the tornado to pass. This undoubtedly helped save lives. Most tornadoes move much faster than this, usually somewhere between 30-40mph. They can rip along as fast as 65 mph. The storm was a persistent supercell that didn’t stop rotating until 6 hours after the first touchdown. The pictures were likely so good and Helicopter Pilot Mason Dunn of KWTV in Oklahoma City was likely able to stay with the storm so long, because it was out there all by itself and was moving so slowly. There were no other storms to try and avoid or make the air more turbulent. It was an LP storm, or Low Precipitation, so, the tornado wasn’t wrapped in rain providing clear shot. Dunn knew what he was doing. He’s a legend in the Oklahoma City area. He was in contact with his meteorologist back at the TV station the entire time. 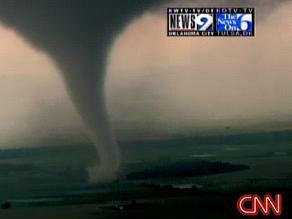 Dunn says he has been chasing tornadoes for about 20 years, and was in awe of what he saw. I’ve had a lot of people ask me since Saturday why would he do this, isn’t it unsafe? Won’t this draw people to the tornado instead of encouraging them to seek shelter? What Dunn and KWTV did, was a tremendous community service. Because he is trained and knew where to safely shoot the tornado, many people knew exactly where the tornado was and where it was going, giving them the best information possible to keep them safe. Of course there is always a risk, and Dunn said despite being about 2 miles from the storm, he could feel the pull of the tornado and had to work to stay far enough away from it. Saturday’s tornado was just one of more than 150 twisters that ripped through the nation’s midsection over 5 day’s time. It all started on Thursday with the monster in Colorado. Friday, Kansas was hardest hit including an EF4 tornado that flattened 3 houses in Quinter. The winds were nearly 200mph! Saturday…the Hennessey tornado, and then Sunday, 5 miles from the home I grew up in, a tornado struck and caused catastrophic damage in Hugo, MN, a suburb or the Twin Cities. A two year old was killed, that child’s sibling is in critical condition, and their Mom and Dad are in the hospital with injuries. All this, despite ample warning that the tornado was on the way, and the sirens were blaring. Sometimes it just breaks your heart to know that no matter what you do, no matter what you say, no matter how great the meteorologists in Minnesota are, no matter how much we understand the science of storms, no matter how great Doppler radar is, how great technology is… sometimes, there’s just nothing you can do except pray. 150 homes damaged, 50 destroyed. The Holiday weekend had many Minnesotans at their cabins (that’s Lake Home to the rest of you), and authorities say the death toll and number of injuries would have likely been much worse otherwise. This same evening, a massive tornado struck and demolished about half of the city of Parkersburg, IA. 8 people are dead from that storm. From the video I’ve seen, it doesn’t get much worse than this. 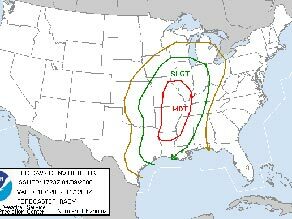 Monday, we were staring down day 5 of tornadoes. With a bit of a respite Tuesday and Wednesday, we're expecting things to pick up again on Thursday. If all 167 tornadoes from the past 4 days verify, we will have seen as many tornadoes in the last 5 months as we would typically see in an entire calendar year. The same is true for the number of tornado related deaths. Why? We don’t know for sure. Part of it is likely due to the jet stream pattern that is being influenced by La Nina (the unusual cooling of the equatorial waters in the Pacific that impacts the large scale circulation). Another reason for our high numbers is due to all the tornadoes in February on Super Tuesday. It’s quite rare to have an outbreak like that in the middle of winter.